Careers evenings go from strength to strength at NGHS, and this one was no exception. A fantastic attendance at our ‘Women in STEM’ event showed that NGHS girls and parents are clearly keen to hear about the amazing opportunities open to young women in Science, Technology, Engineering and Maths (STEM). We were also delighted to welcome an alumna again, as one of our guest speakers. 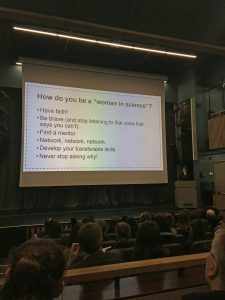 With women under-represented in many STEM degree and career areas, the Careers Department arranged for female speakers from areas such as software engineering, stem cell research, radiotherapy and pharmaceutical research to share their experiences and encourage our girls to choose a STEM pathway. Bethan Murray from Rolls Royce flew the apprenticeship flag. Having turned down a full time university place, she highlighted the benefits of working for a global company at the age of 18; benefits which include their funding of her engineering degree at Warwick University. 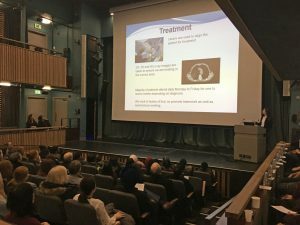 From Nottingham City Hospital, Therapeutic Radiographers, Lynsey Barwell and Hannah Johnson spoke about a less well known, highly patient-centred role, and about the advanced medical technology they use and why they love what they do. All of our speakers shared a passion for their jobs and Software Engineer Anna Dodson from ‘Imosphere’ was no exception. Talking about a typical day in her working life, she also debunked a few myths about a programming career. Both Andreea Iftimia – Mander and 2009 NGHS alumna, Lyndsey Johnson, work in stem cell research at MediCity’s ‘Locate Therapeutics’. They highlighted how degrees in Chemical Engineering and Medical Biochemistry respectively, can lead to such incredibly rewarding work which may one day result in innovations such as artificially creating new bone tissue. Similarly, pushing forward with scientific advances, was Lorna Duffy. Lorna is a Senior Scientist with drug discovery company ‘Sygnature Discovery’, and she talked about the high level of qualification required in the industry with PhDs being a common expectation amongst their scientists. Nottingham GP and University of Nottingham lecturer Katie Rhodes spoke about the highly competitive selection process for Medicine, but also explained how rewarding and flexible her role as a GP can be. Currently her position allows her to make time to work with the University Medical School on its admissions procedures, as well as being an NGHS mum too!